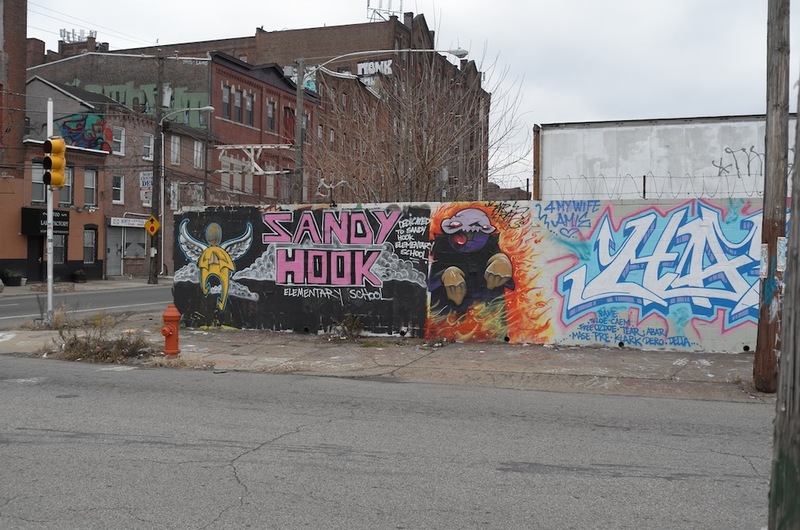 A memorial to the victims of the Sandy Hook shootings at the intersection of 5th and Cecil B. Moore, a so-called “Murder Corridor” in North Philadelphia. From 2007 to 2013, 299 children were murdered in the city; the majority of these victims were black, and shot to death in North Philly. (Photo Copyright Jason Francisco 2012). It’s been two years now since December 14, 2012. On that morning, twenty year-old Adam Lanza, a young man with an extensive history of mental health problems, shot his mother four times in the head while she slept. He then drove to Sandy Hook Elementary School, in Newtown, Connecticut, which he had attended as a child. Wielding a Bushmaster XM-15 and carrying a pair of pistols, Lanza entered the school at 9:35; stalking the halls and classrooms, he shot and killed twenty children and six adults before shooting himself in the head at 9:40. There’s been a lot of ink spilled about Adam Lanza since Sandy Hook: a mountain of coverage, including several books, and a slew of government-commissioned reports, among them one produced by the Connecticut State Attorney’s office – a document that, as I wrote at the time, raised more questions than it answered. Yet another report was made public just before this past Thanksgiving, this time from the Connecticut Office of the Child Advocate (OCA). The OCA report fills in many of the gaps in previous analyses of what led up to events that December day, and merits close attention – I will turn to it shortly. But reading this report, it’s impossible not to think, too, about what else has been happening since Sandy Hook. I’m referring not just to the escalating number of school shootings that have occurred since Newtown, but also to the ongoing protests over the deaths of Michael Brown, Tamir Rice, John Crawford, and the scores of other young black men and women killed by police. It’s impossible not to think about these deaths while reading the OCA report, because, if any one thing leaps from its pages, it’s the fact that what Adam Lanza did at Sandy Hook would not have been possible without the enabling forces of white privilege, white wealth, and white impunity. Indeed, with pundits cynically trying to derail discussions of structural racism and police brutality by speciously concern-trolling about so-called “black-on-black crime,” it’s time to talk about Sandy Hook in a different way: not just as an act of “white-on-white” crime, but as an event that is inseparable from the white supremacy that helped produce it. At just under a hundred and twenty pages in length, the OCA report reveals that what happened at Sandy Hook would have been utterly unthinkable if not for the selective attentiveness, determined along racial lines, of multiple American institutions – from our schools to social services to the prison-industrial complex. Before turning to the report itself, it’s important to stipulate the reality of how these institutions function when it comes to dealing with black youth, whether or not they suffer from psychiatric problems, and particularly when they do. If they’re not failed by our schools, or brutalized by police, the odds that black youth will end up in juvenile detention, restrictive residential placement, or prison are likewise disproportionately high. Black youth are four-and-half times more likely than whites to be arrested for the same crimes and four times more likely to wind up in residential placement. Together with other minorities, blacks make up two-thirds of all youth in the juvenile justice system – and while arrest rates for other minorities has steadily fallen to below 1980 levels, this trend has not extended to blacks. Meanwhile, the shameful over-representation of black adults in US prisons is a matter of common knowledge and public record; in 2010, when blacks made up 13% of the nation’s population overall, they comprised 40% of the prison population. In that same year, in Connecticut specifically, while only 10% of the state’s overall population was black, nearly 41% of the people held in its jails were. When mental illness enters the mix, the risks faced by young people – and particularly by black youth – are even more acute. The National Alliance on Mental Illness estimates that only 6% of Americans suffer from a serious mental health illness, and studies indicate that only 4% of violent crimes involve perpetrators who are mentally ill – in fact, mentally ill persons are considerably more likely to be the victims of violence than its perpetrators. And yet encounters between police and the mentally ill regularly turn tragic, fast. As my friend Harold Braswell has compellingly written, poorly-trained police consistently and disproportionately respond to calls involving mentally ill suspects (armed or otherwise) with overwhelming violence. The “irrationality” exhibited by mentally ill individuals can prompt police to apply deadly force when non-lethal means would otherwise suffice: in states like New Mexico, nearly 75% of suspects shot by police are mentally ill. And when the mentally ill person in question is also black – as the recent cases of Kajieme Powell and others suggest – the impulse to lethally “neutralize” them appears even harder for police to resist. Unsurprisingly, a similar pattern – of acute discrimination against blacks, the mentally ill, and the black mentally ill in particular – plays out in our prisons. Our adult penal system essentially “warehouses” the mentally ill to the point that the three largest de facto “mental health institutions” in the country are Riker’s Island in New York, Cook County Jail in Chicago, and the LA County Jail. Likewise, the juvenile justice system is jam-packed with children who suffer from mental health issues, some of which are outright debilitating. As the National Alliance on Mental Illness outlined in a 2010 report: “Seventy percent of youth in the juvenile justice system also experience mental health disorders, with 20 percent experiencing disorders so severe that their ability to function is significantly impaired.” Of some 13,000 people who were incarcerated in Connecticut in 2010, 3,400 were mentally ill – a number that does not take into account those held in local jails. Unsurprisingly, research data also indicates that, across the board, black youth with mental illnesses are drastically less likely to receive meaningful mental health treatment while in the penal system, or even to be flagged as in need of care in the first place. In fact, in states for which data is available, black youth with mental illness are considerably more likely to be sent to juvenile jails (as opposed to inpatient treatment centers) than their white counterparts. With this backdrop in mind – a continuum of systematic anti-black discrimination at every level of our nation’s educational, police, judicial, and penal infrastructures, and an intersecting and synergistic brutalization of the mentally ill – let’s turn to the Connecticut Office of the Child Advocate (OCA)’s report on Sandy Hook. Unlike previous reports, which have been primarily preoccupied with tracking the events on December 14 specifically, the OCA report concerns itself with what led up to the massacre, systematically chronicling all of Adam Lanza’s interactions with various institutions and individuals from teachers to school counselors to mental health specialists to ER doctors. And the picture of these interactions the OCA report paints is damning, not just because it reveals an utter lack of communication between these actors and institutions (a “silo-ing” of information), but also because it demonstrates that, while countless “red flags” about Lanza were raised, the consistent attitude of authority figures was to unquestioningly defer to and accommodate his wealthy mother’s tragically misguided insistence on overruling their recommendations as to Adam’s treatment in a way that the report itself makes clear would have been unthinkable if she were nonwhite or poor. From the start, Adam Lanza clearly had problems – with sensory integration, language processing, and more. But unlike countless children, Adam’s parents had abundant financial resources and, at least as far as his mother was concerned, near-limitless time and willingness to devote to managing his issues. Until she lost her job in what appears to have been a case of workplace discrimination stemming from her second pregnancy, Adam’s mother, Nancy, was a high-powered, successful Boston stockbroker who left her job with a large settlement in her pocket and then turned her energies toward raising her children full-time. When Adam’s father, Peter, became a Vice President for Taxes at a major subsidiary of GE, he purchased the family a 3,100-square foot home in Newtown, a wealthy bedroom community where the median family income hovers around $100,000 a year. Peter was a workaholic and a self-identified “weekend father” who left the domestic labor to his wife, but when they divorced in 2009, their separation was amicable. Peter left Nancy the house and committed to making alimony payments that ranged from $250,000 to $290,000 a year, assuring her she would “never have to work another day in her life.” Crucially, Peter also committed to keeping Adam on his own insurance plan and to footing his medical bills. Just as Adam’s family could afford to pay for the individual care he needed, there were dozens of providers willing and eager to offer it. The OCA report chronicles countless encounters with pediatricians, child development specialists, and mental health practitioners who diagnosed Adam with a more-or-less consistent suite of comorbid problems: Sensory Integration Disorder, Pervasive Developmental Disorder, Obsessive Compulsive Disorder, Anxiety and Major Depression, Anorexia, and Asperger’s (the latter of which has since been superseded in the DSM-V by the broader category of Autism spectrum disorders). As Adam’s primary caretaker, Nancy Lanza was regularly recommended treatments for Adam, ranging from boutique talk therapies to high-tech neurological scans, all of which she consistently declined. Instead, Nancy opted for a direct, hands-on approach in which she served as the primary, even sole caretaker of her son, and as the ultimate arbiter of what “truly” ailed him. To this end, Nancy retained the services of a “community psychiatrist,” a private practitioner who did not cooperate with the OCA, and who appears to have only seen Adam infrequently. This psychiatrist’s primary function seems to have been to write doctor’s notes for Adam, at first excusing him for missing classes and then justifying his withdrawal from school altogether – over and against the dire warnings of numerous mental health professionals that what Adam needed was not less interaction with children his own age, but more. The OCA report exposes an undeniable pattern: as Adam’s symptoms worsened, as more people around him became more concerned about his welfare, and as more opportunities were made available to him for care, his mother correspondingly exerted herself to downplay the severity of his condition, to accommodate his symptoms, and to shelter him from institutional interventions. What matters here is less Nancy Lanza’s motivations – although I will address these below – than the fact that authority figures consistently deferred to her even when it was clear that her decisions were actively contributing to Adam’s deterioration. As far as interactions with healthcare institutions are concerned, two examples will suffice. Consistent with his diagnostic profile, Adam’s OCD symptoms increased markedly during his middle school years, to the point that, in September of 2005, Nancy took him to a Danbury emergency room for a “crisis evaluation.” In the ER, the report documents, “Mrs. Lanza described AL [Adam Lanza] to health care providers as having had ‘borderline autism’ in the past, but having since outgrown it. She reported that AL was having trouble in school, trouble in groups, and exhibiting repetitive behaviors which had gotten worse in recent days…[She] reportedly feared the ‘beginning of possible autism.’” Staff psychiatrists, clearly troubled by Adam’s agitation, his unwillingness to be touched, his hyper-vigilance, and his cowering, “overwhelmed with fear,” recommended that he be held for an extended evaluation. They encouraged Nancy to pursue placement for Adam in a therapeutic educational program in Connecticut’s Center for Child and Adolescent Treatment Services (CCATS), and additionally offered to do a full clinical evaluation of Adam in order to expedite his admission into the program. Nancy declined both the evaluations and the referral, and instead demanded that Adam be discharged immediately so she could take him home, where he would be “better off” and “more comfortable.” In fact, as she explained to hospital staff, her sole reason for coming to the ER in the first place was to get Adam issued an absence note for missing several days of school due to the “agitation” produced by the hospital visit. ER staff gave her this note, with the caveat that she promise to seek a consultation with a specialist to arrange an Individual Education Plan (IEP) for Adam within three days. And yet this meeting did not occur until December, a full three months later. Why hospital staff were so quick to accede to Nancy’s insistence that Adam was better off with her than under their supervision, and why they appeared to have not followed up on his discharge remain unclear – but whatever image Nancy projected to them, they clearly deferred to it. Nancy ultimately cut off further follow-ups with the Yale group, and when Adam reacted negatively to medications he had been prescribed, she stopped giving them to him. From then on, Adam’s sole encounters with mental health professionals appear to have been with his community psychiatrist, only infrequently at that. For her part, by this point, Nancy seems to have been preoccupied only with accommodating her son’s ever-increasing obsessive demands and palliating his symptoms, not with offering him meaningful treatment – much as, several years prior, when Adam’s obsessive hand-washing became so vigorous that his fingers and knuckles grew bloody, she had taken him to a pediatrician, who gave him a prescription for hand lotion and sent him home.¹ After 2008, it appears that Nancy no longer sought any medical treatment for Adam whatsoever. Despite this, the report notes, “there is no evidence of communication in any form between the school and AL’s parents about this book.”² Meanwhile, as Adam matured, the red flags grew even more alarming. As one teacher recalled: “I remember giving creative writing assignments to students, instructing them to write a page or two on whatever they wanted to talk about . . . AL would write ten pages obsessing about battles, destruction and war…I have known 7th grade boys to talk about things like this, but AL’s level of violence was disturbing.” And still, no action was taken. How could all this happen? Time and again, it appears, the recurring theme in the OCA report is that Nancy Lanza tirelessly advocated for her child – no doubt with his best interest in mind, but in a way that clearly contributed to his decline. And she did so, time and again, in the face of virtually no resistance from institutions that treat other children quite differently indeed. Nancy didn’t just let her son use her guns, she bought him guns of his own – potentially illegally, given his age – and took him with her to the firing range to “bond.” Between the two of them, Nancy and Adam owned at minimum five firearms – and when police raided their home, they discovered 1,600-odd rounds of ammunition, edged weapons including a spear and three samurai swords, and more. And although Adam reportedly “disliked birthdays, Christmas, and holidays,” police also discovered a check from Nancy made out to Adam as a gift, with a memo indicating that he was to use it to buy himself a CZ 75. At which point, we can return to the question with which we started: would any of this be thinkable if Nancy and Adam Lanza had been black? We can work backwards, starting with the guns: in a nation where a black teenager can be shot when a federal marshal mistakes his Three Musketeers candy bar for a pistol, or where Tamir Rice can be summarily executed for holding a toy gun in public, how many black mothers would not just give their mentally ill teenager access to an unsecured arsenal, but actually gift him a handgun for his personal use? Likewise, whereas by all odds a black child with Adam’s attendance record would have had child services show up at his house and potentially haul him away for truancy, Adam’s mother kept him holed up in her cul de sac and hired a psychiatrist to write him notes, first excusing his absences and then pulling him out of school altogether. The OCA’s report openly wonders: “We cannot know the degree to which Mrs. Lanza may have heightened or mollified the school’s concerns about AL, and she certainly presented as invested and concerned for his welfare.” Although much of that persuasive self-presentation may have derived from Nancy Lanza’s dogged willpower, managerial savvy, and fluency in navigating otherwise baroquely bureaucratic institutions, we’re kidding ourselves if we deny that a large part of it also depended on the simple fact that she was white and had money. Scientists are currently sequencing Adam Lanza’s DNA in hopes of somehow determining what went wrong with him. The boutique technologies his mother waved away from helping Adam while he was alive are now being used to examine him after both of their deaths, in the vain hopes of explaining what “caused” the Sandy Hook massacre. But we don’t need ultra-expensive laboratory equipment to see what facilitated Adam Lanza’s actions, what made them possible. The answer to that is staring us in the face. Here’s the hard truth. If Adam Lanza had been a young black boy, raised by a working-class, single mother, the odds are we wouldn’t know his name. He’d likely be dead now, but not by his own hand – some cop would’ve seen to that, and quite possibly well before Lanza even hit his teens. Or Lanza would have spent his childhood shuttling between juvenile detention, foster care, and ultimately in and out of jail, a “frequent flier,” in police lingo. Or he’d be rotting in some high-security mental health facility, doped to the gills on Seroquel and on an indefinite psychiatric hold, with no release in sight. Or he’d be just another mentally ill young man, charged as an adult, thrown in with gen pop, left to fend for himself. All of these alternative scenarios are unequivocally vile. If Adam Lanza had been black, and any of these things had happened to him, it would also have been horrible. The discrimination and violence inflicted upon black youth by our nation’s schools, police, and courts represents a travesty for which history will judge us and which we must strive to change in our lifetimes. But there’s also a vileness to the double standards that allowed Adam to escape scrutiny and intervention from institutions that were keen to help him even as they refuse to help, and indeed, actively persecute black children. Indeed, in a peculiar way, it was Nancy Lanza’s cultural and financial capital – her entitled attitude towards interacting with institutions on her terms alone, and her privileged blindness to the disaster brewing in her own home – that doomed her, her son, and the innocents that he killed. And here lurks another hard, vile truth. It’s something that becomes clear as you survey the wreckage Lanza wrought, and then contemplate what did (and didn’t) follow it. In less than five minutes, Lanza butchered twenty-six toddlers and teachers, nearly all white, in a posh suburban school in one of the wealthiest states in our country. And yet for all the hand-wringing that followed Adam Lanza’s rampage, not only has the subsequent lack of decisive legislative action been appalling, but gun manufacturers have reaped hundreds of millions of dollars in profit specifically because his actions ultimately increased market demand for their product. In other words, the repulsive truth is that while we live in a nation where people are staging die-ins and bravely mounting protests to broadcast a message that should be obvious – that Black Lives Matter – we also live in a society where, from the start, Adam Lanza’s whiteness mattered still more, and where money mattered, and continues to matter, even more than that. Adam Lanza appears to have also maintained this impression of himself: not only was he apparently convinced that he would be able to attend college without difficulty, his first-choice school was Cornell – to which his academic transcript clearly precluded him from having even a tenuous chance of admission. Likewise, despite the counsel of his father, Adam adamantly insisted that he try to take no less than five courses a semester at the local community college he attended after graduating early from High School, all of which he either dropped out of or failed. The OCA report notes that these frustrations may have played a precipitating role in his decline. I want to thank Janelle Christensen for many of the resources I link to here – many of which are available via Sociological Images; I’m also grateful for the abundant and edifying resources produced and maintained by Mariame Kaba at Prison Culture. Finally, I’m grateful to my friend Jason Francisco for allowing me to share the photo from his remarkable series, “These are the Names,” and to Jim MacMillan of #GunCrisis:Philadelphia for directing me to police data about gun violence in the city. Any errors in my writing are mine and mine alone – please reach out, let me know, and I will correct them accordingly. This entry was posted in Uncategorized and tagged adam lanza, black on black crime, double standards, mental illness, nancy lanza, newtown, psychiatry, race, racism, sandy hook, white on white crime, white supremacy on December 11, 2014 by Pat Blanchfield.